I posted earlier about how when I read names on 9/11, it occurred to me that the people I was reading names with were the people who went down there to help and lived. The readers this year were first responders and volunteers. When we were lined up to read, I turned around and took pictures of the people in the line behind me. Some of you may remember me pointing out the sweet faced guy in the white hat. 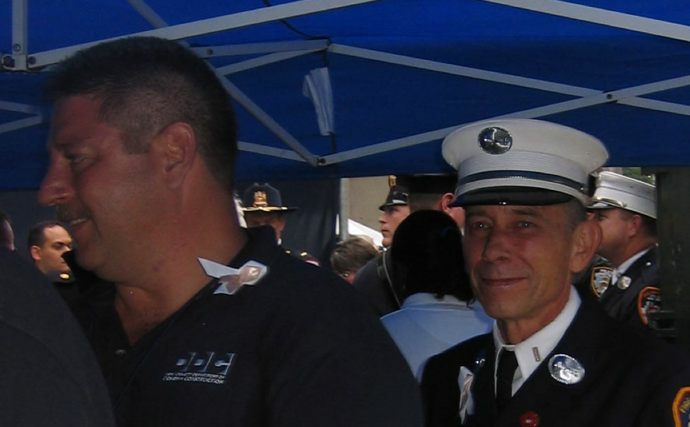 Mickey Kross, a Lieutenant with Engine 16, was in stairwell of the north tower when it collapsed. I found his story in his own words. I’m posting a few excerpts, but the full story is here.